An eight-track album of 1940’s silky-smooth close harmony pieces with lyrical subject matter ranging from the USO (United Services Organisation), and Choo Choo’s, to a little Christmas ditty called Hurry Santa. 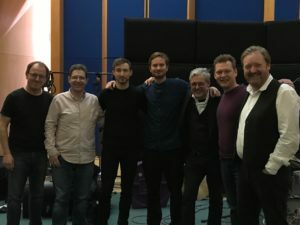 Mike Smith (drums), David, Ant Law (Guitar), Tom Farmer (Bass), Colin Good (Piano), Jeff and Audio Network founder Andrew Sunnucks. Our first collaboration with Joanna couldn’t have been easier. A mainstay on the London vocal scene, Joanna is equally at home in practically every genre of music, but it’s her time spent with the Swingle Singers that made this project, in particular, the right one for Joanna. Back row: Enrico Tomasso (Trumpet), Malcolm Earle-Smith (Trombone), Mark Crooks (Clarinet), Howard McGill (Alto/Flute), Phil Todd (Tenor/Flute). After a stunning day of rhythm and horn sessions, the stage was set for the evening vocals. 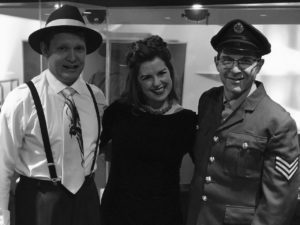 What better way to get into the spirit of the music than to wear vintage 1940’s clothing, so that’s exactly what we did. David in an R.A.F. uniform, Jeff in 40’s-style trousers with suspenders and hat and the girls in classic matching Andrews Sisters’ outfits. Joanna joined by Sara Brimer-Davey and Joanna Goldsmith-Eteson expertly weaved their way through the vocal arrangements for three hours of pure joy. We were all instantly transported back almost 80 years. 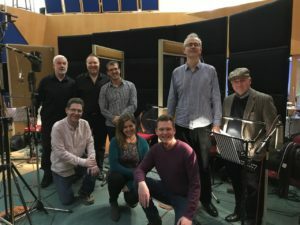 Each of us in the studio that day commented on how we couldn’t remember a recording session that was more fun – and since we are collectively talking about thousands of hours of studio time that is really saying something! Look for our Vintage Vocal Swing album to be released by Audio Network in summer 2018!